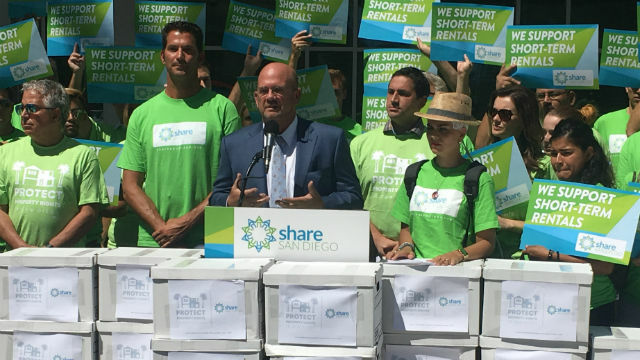 A pro-vacation rental coalition led by Airbnb and HomeAway submitted signed petitions Thursday to force the City Council to rescind a compromise ordinance or put it San Diego voters. The group was joined by Councilman Scott Sherman, who has argued that the compromise spearheaded by Councilwoman Barbara Bry unfairly restricts homeowners. “This signature gathering effort is a direct result of extreme government overreach by the City Council that took away the property rights of many San Diegans. If signatures are verified, the council will be forced to scrap this knee jerk de-facto ban, or, I am confident San Diego voters will do it for them,” said Sherman. The coalition had 30 days from the council’s July 31 vote to collect signatures equivalent to five percent of registered voters in San Diego, or roughly 36,000. If the San Diego County Registrar of Voters verifies that the required number of valid signatures were obtained, the City Council can either rescind the ordinance or put the issue to voters. Under the new rules, home owners will be able to rent their primary residence while they are not present for up to six months each year as long as they apply for a permit and pay an annual fee of $949. Three-night minimums will be required in coastal areas and downtown. The regulations prevent both local and out-of-town investors from renting multiple properties other than where they live, but allow San Diegans who have an additional unit on the same property as their primary residence to get a license for a second vacation rental. It’s the prohibition on renting second homes that has drawn the ire of the home share services and many homeowners. Bry’s ordinance is set to take effect in a year. Short-term rentals are technically illegal now, but the city has not enforced regulations pending passage of an ordinance, which has been in the works for several years.